When was the last time your CEO personally called IT? If it’s ever happened, it was probably because something was very, very wrong. But expectations have changed, and IT has become a valued strategic partner to the business. As IT becomes more aligned with other departments, it only makes sense for the C-suite to be more proactive about creating open channels of communication with IT. In other words, maybe the CEO should be calling IT—and not just because something is on fire. That’s why we had the idea to get the conversation going. We commissioned a survey of 500 IT professionals with data center, server and cloud infrastructure responsibilities who work at businesses and enterprises with more than 100 employees in the United States and Canada. Their answers ranged from straightforward and simple to humorous and even impassioned. In our analysis, several themes emerged. What follows is a rundown of those themes and what we think they say about IT, along with 60 of the most colorful, insightful and interesting responses. By a wide margin, the largest share of responses expressed a desire to merely be appreciated and acknowledged for the effort and dedication they bring to their jobs. This sentiment was echoed and expounded on in many responses that fit into other themes as well. It might be expected that professionals from virtually every function in any organization would express this. But for IT professionals, feeling underappreciated is simply one way in which they feel pressured by their job, as you’ll see. No surprises here: Many IT pros feel squeezed by a lack of resources, whether budget, training, headcount or all of the above. As the role of IT has expanded far beyond tech support and merely maintaining systems, it’s clear that IT pros don’t feel the amount of resources they are given has kept up with the growing scope of their responsibilities. This issue is compounded by the fast pace of technological advancement and the continuous need for education and additional staff to properly leverage new technology. And lurking beneath the call for greater resources is also the negative impact that staffing shortages have on the department as a whole. As we covered in a recent blog on IT’s time, the question of morale—and its effect on effectiveness and efficiency in the IT department—is not one to be ignored, especially as the importance of IT’s role to the rest of the business continues to grow. Organizations are looking to IT to lead digital transformation, and IT is stepping up to the challenge. This can only increase the value that IT brings to the business’s bottom line. Yet with this leveling up of the function’s strategic importance come the growing pains of shedding old notions about IT’s role in the business. It’s old hat at this point to think of the IT role as primarily the help desk or computer troubleshooting, and it’s becoming clear that even the routine maintenance and monitoring of infrastructure is not where IT can deliver the most value to the business. Instead, IT pros can and want to be more involved in managing digital transformation across the enterprise, in addition to turning the department into a true center of innovation. 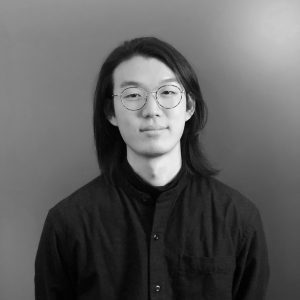 Even as IT professionals want to be recognized for the value they bring to digital transformation and innovation, many also expressed a desire to be appreciated for the basic technological functionality that they ensure for the rest of the organization. The routine, the mundane, the day-to-day: Whatever you want to call it, it’s integral to the entire organization’s ability to function, yet many IT pros don’t feel that it’s treated as such. On top of that, there is the sense that the important work goes on outside the visibility of the rest of the business, and thus unnoticed. There is a lot to unpack here, but it all boils down to one thing: many IT professionals are frustrated that their CEOs seemingly just don’t get it. And when the CEO doesn’t know exactly what you do—or you’re not sure that they do (we’re not sure which is worse)—then you’re going to run into a host of problems. One of these problems is unrealistic expectations, as explained in the quote above. And when your CEO doesn’t know the scope of what you’re doing, they won’t understand why you can’t do some things. Likewise, another respondent pointed out how IT isn’t a “traditional” kind of job. But many responses also just boiled down to a desire for their CEOs to understand and recognize the daily challenges of the job. As we covered recently, IT professionals are extremely conscious about the time they spend at work and what they do with it. As illustrated by some of the responses to this question, many wish their CEO knew about the amount of after-hours work they have to put in. Others are frustrated with the work getting in the way of value-added, innovative work. Still others would like to have a healthier balance between work and their life outside of it. In our survey, we found that the No. 1 thing IT pros would do if given back 16 hours in their week is “reclaim work-life balance.” Given these responses, that’s probably no surprise, and the dangers of burnout are real, so this should be worrying. Security is and will continue to be top-of-mind for IT professionals. Yet while the downsides of unsecured IT infrastructure and potential data breaches are well-known, many respondents don’t believe that their CEO is appropriately informed on either the importance of security nor how it is maintained. Some responses pointed out the difficulty of assuring infrastructure security and the need for more resources. Others highlighted the constant vigilance and effort required to stay ahead of information security threats. Still, others merely wished their CEO stayed current on the extent to which security is crucial to the business as a whole, especially in light of how relentlessly security threats appear and evolve. Many of the responses in this category partially relate to a desire for recognition for how stressful, complex and harrying IT jobs can be, as exemplified in the quotes above. Special emphasis was placed on how quickly a day can go from “normal” to crisis mode or the constant stress of maintaining the critical systems that the whole organization relies on. Yet one of the most interesting takeaways is the extent to which many IT professionals see their roles as uniquely challenging. Given the rapid clip at which technology is developed and released, it’s no wonder that IT pros feel caught between mastering their current skill set while also keeping ahead of trends by picking up new ones. And this is something they believe is innate to the IT function and thus not properly appreciated by the rest of the business, including the CEO. But overall, the message still remains the same: IT pros want to be valued and appreciated for the effort they put in just to be competent at their roles. 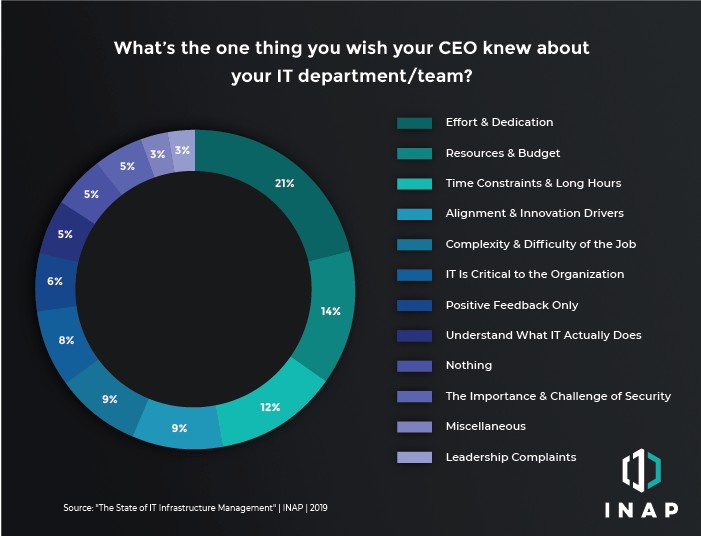 Encouragingly, there were a good amount of responses that showed a strong level of alignment and involvement between the CEO and the IT function. Most of these emphasized strong communication and a deep feeling of mutual understanding when it came to the value of IT, organizational priorities and goals, and operations. Nearly all of these responses referenced a regular cadence of communication, whether weekly or monthly meetings, formal or informal. Some made note of the CEO’s IT background, indicating that a demonstrated knowledge of IT’s technical role can make a big difference in ensuring alignment. Though a tiny sliver of the responses, several IT pros identified specific leadership complaints about their CEO. They correspond to much of the positive feedback other respondents had. Specific complaints include a lack of technical knowledge, infrequent or poor communication and alignment, and a lack of vision for IT. Some respondents simply said that there was nothing they wish their CEO knew … or maybe they were just eager to get back to work.